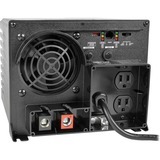 The APSX750 750W APS X Series 12V DC 230V AC Inverter/Charger is a reliable power source for a wide variety of equipment ranging from power tools and portable lighting to laptop computers and sensitive monitoring equipment. With no fumes, fuel or excess noise, it's an excellent alternative to generator power.The DC-to-AC inverter features an automatic line-to-battery transfer switch and integrated charging system that allow it to work as a vehicle inverter, standalone AC power source or extended-run UPS. 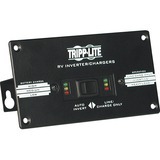 It delivers 750W of continuous power, 1125W up to one hour, or 1500W of peak power up to 10 seconds during equipment startup or cycling. 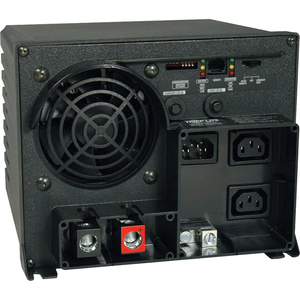 An automatic overload detector, cooling fan and resettable AC circuit breakers protect the unit from damage.Designed for easy installation in RVs, over-the-road trucks, fleet vehicles and conversion vans, the APSX750 converts stored power from any 12V battery or automotive DC source to safe, stable, computer-grade AC power for unlimited runtime. 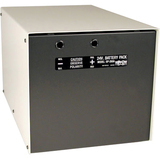 When hardwired to an external 230V AC source, the unit keeps the user-supplied battery charged via a three-stage 5/20A selectable charging system while simultaneously delivering AC power to connected equipment.When used as a UPS, the APSX750 responds to blackouts and brownouts with an automatic, instantaneous transfer to battery-derived AC output. 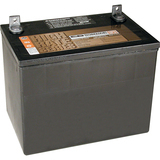 LEDs on the unit indicate load percentage and battery charge level.